It’s easy to share your Photo Albums using a single, simple link generated by Keep&Share. Each of these links will lead to your photo album as it is styled within your account. If you want to make any changes to your photo album appearance, you will need to do it from within the editing mode of your photo album. 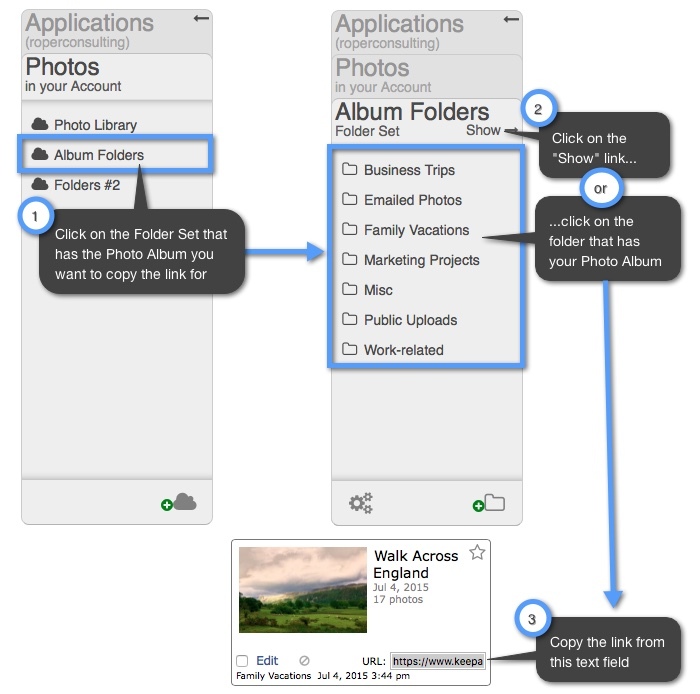 Once you copy the link to your link to your Photo Album, you can add the same URL parameters to the end of your album link as you would for choosing your album viewing style and controlling your album appearance. When you are copying your link for your photo album you will notice that you have two link options: the “Album URL” and the “Short URL.” In the example below, we list what the Album URL will look like versus the Short URL. You can use the shorter URL for social media accounts that have limited characters (such as Twitter) or for emails where the link address might get cut short. Sometimes if a longer URL is split into two lines on an email the URL may lead to the wrong address as part of the link has been cut off.